The USTA Billie Jean King National Tennis Center in Queens, New York, home of the US Open, where more than 700,000 tennis fans will watch the top men’s and women’s players from around the world compete for a staggering $42,253,400 in prize money seems a very unlikely place for High Holiday inspiration. Yet, a non-Jewish player with a very Jewish neshama, has a lot to teach us about introspection and spiritual preparation-important lessons as the Yamim Noraim, the Days of Awe approach. 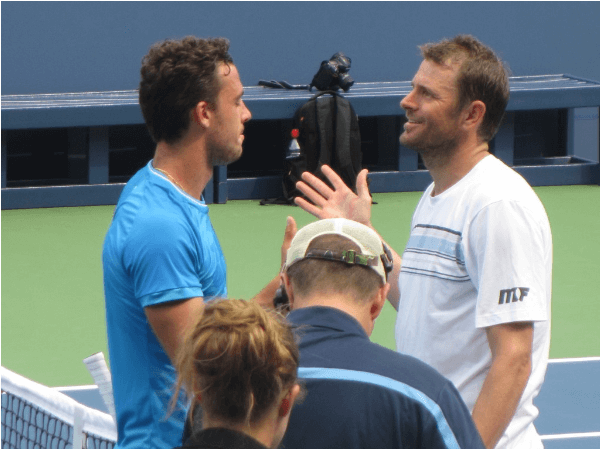 While other players are giving post-match press conferences which focus on the match itself, Mardy Fish is speaking about the difficult road he has traveled these past three years. Fish is best known for a successful tennis career where he won six tournaments on the main ATP Tour, he reached the finals in the 2004 Olympics, and was in the quarterfinals in the 2007 Australian Open, the 2008 US Open, and the 2011 Wimbledon Championships. 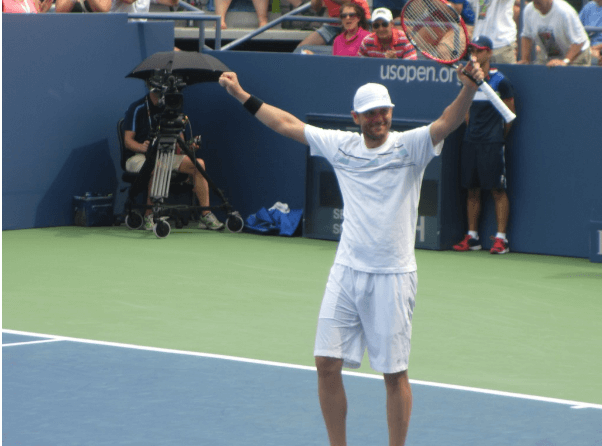 In April 2011, Fish overtook fellow American and close friend, Andy Roddick to become the American No. 1 in the ATP rankings. Fish earned more than $7.3 million in prize money as a professional tennis player, and he reached a career high of 7th in the world. Then, in 2012, everything began to change. Fish began to experience some health problems which impacted his tennis career. At first, Fish reported fatigue as the reason for not playing during the European clay court season. He also withdrew from the 2012 French Open. During the year, he was treated for sever cardiac arrhythmia and had cardiac catheter ablation to correct cardiac arrhythmia. Fish used a heart monitor regularly and experienced sleep difficulties. Ranked 23rd for the US Open, Fish withdrew in the 4th round before his match with Roger Federer. As Fish and his wife were about to leave the gate to return to Los Angeles, his wife saw how Fish had panicked and his heart was racing. Gardner insisted they got off the plane, and they chartered a private jet five days later. Fish was afraid to leave the house for three months. Fish continued to experience crippling anxiety and panic attack for thirty minutes each day. He was eventually diagnosed with anxiety disorder and panic attacks. Fish hasn’t played much tennis since 2012. In 2013, he competed in 9 matches, took up golf, and spent a lot of time with his young son, Beckett. Fish recently decided to return to Queens to play in one last US Open; he will retire when he is no longer in the tournament. In preparation for his retirement, Fish has played in some recent tournaments. He lost in the first round of a tournament this summer in Atlanta to Israeli Dudi Sela, and lost in the second round in Cincinnati to Andy Murray. He has also had some success in doubles this summer. But most importantly, Fish has come a long way in these three years and is an inspiration to all who hear his story. Fish has become a spokesperson for anxiety and panic disorder and for mental illness. And Fish is an inspiration to sportswriters. After US Open matches, players are required to speak to members of the media, if requested. Some players, especially in the early rounds, don’t attract much attention. And questions tend to focus on the match just played, on the upcoming opponent, etc. The Fish post-match conference was attended by 40 or 50 reporters and photographers. The transcript of the Mardy Fish press conference filled four typed pages, with most questions focusing on his anxiety disorder. The transcript could not adequately capture Fish’s calm, thoughtful demeanor. Fish’s introspection and honesty struck me as very appropriate and inspiring for the pre-Rosh HaShanah and Yom Kippur season. During Elul, the month before Rosh HaShanah, we examine how we have behaved during the past year, and we think about how we can improve our behavior in the coming year. We consider atonement, ask forgiveness, reconcile, and to seek closeness with God. Fish has clearly accepted who he is and he has made an action plan to heal — both himself, and the world. He helps others by speaking openly about mental illness, and he has been working with Athlete Ally, an organization which combats homophobia in sports.